Constructed: beginnings in the 4th century B.C. Alterations: probably expanded in the 3rd century B.C. as well as in the late 1st / early 2nd century A.D. (Flavian-Trajanic-Hadrianic); comprehensive restoration around 367 A.D. However inconspicuous and hidden the Porticus Deorum Consentium may seem on the present-day excavation site: The shrine in the south-west corner of the Forum, where the road ascends the Capitoline Hill, provides us with stimulating insights into different facets of the history of the Forum Romanum with regard to the daily routines of religious procedures on the Forum during the Republic and Imperial Period as well as the modifications made to the buildings on the Forum in Late Antiquity. 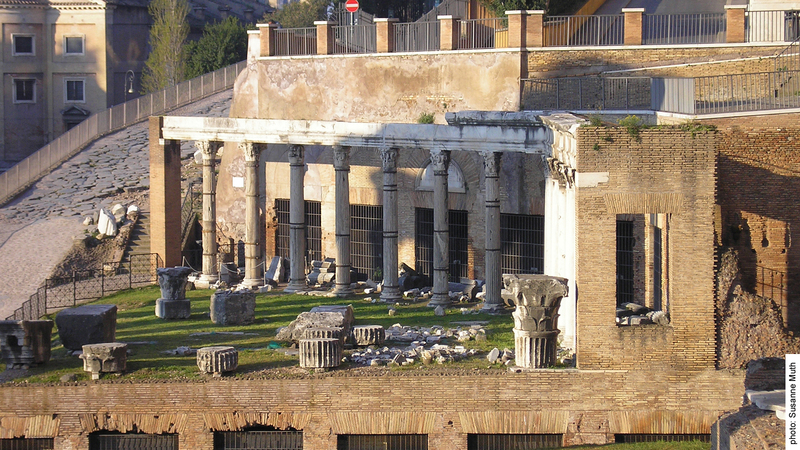 The Porticus Deorum Consentium served as a shrine for the cult of the Dei Consentes, “the united gods”. Twelve gods were honoured here (we know this for the period of the late Republic), among them six goddesses: Jupiter, Apollo, Mars, Mercury, Neptune and Vulcan as well as Juno, Minerva, Ceres, Diana, Venus and Vesta. Their gilded statues must have stood along the Forum and they were worshipped during cultic celebrations, the lectisternii, where public feasts were held and the statues were entertained to a meal. It is not quite clear how precisely the statues were arranged, how the celebrations of the lectisternii were organised and how the cult site was decorated in general. This site has survived in its architectural form from Late Antiquity to this day on the Forum. 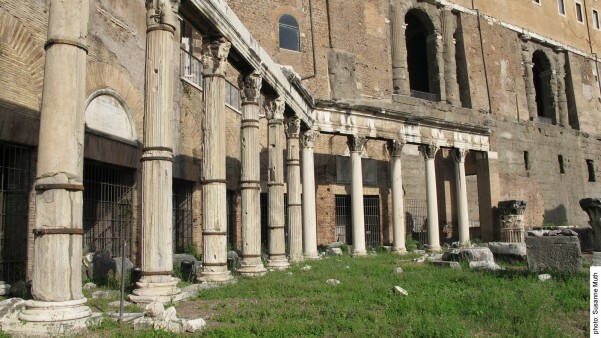 It is composed of a portico with eight adjoining chambers and a forecourt connected to the clivus Capitolinus: Where the statues were erected here remains unclear. The literary sources speak of a temple belonging to this cult (“aedes deorum consentium”) in the Late Republic. However, it is very hard to establish a connection between this temple and the topographically examined cult site, which was restored in Late Antiquity and named “porticus deorum consentium” (as we know from an inscription). An examination of the literary sources as well as of the remnants has suggested that the shrine was first built in the middle Republic. According to the literary sources the first feast honouring multiple gods (lectisternium) was hosted in the early 4th century B.C. We can assume that the establishment of the cult also led to the formation of an area for the cult site. The remnants of a wall composed of ashlar tuff blocks, which constituted the back walls of the later chambers, can be allotted to this beginning phase. We can infer from further traces of earlier walls that the cult site was extended in the 3rd century A.D. Perhaps the sacred structure (“aedes”) which the literary sources refer to was built within this context; however, no traces of this structure can be found in the material remains of the cult site that was restored in Late Antiquity. In the second half of the 1st century A.D. further alterations were made to the cult site of the Dei Consentes. The modification and rebuilding of the site most probably lasted until the Trajanic-Hadrianic period. Another restoration of the site occurred in the middle of the 4th century A.D. The inscription on the architrave of the portico designates Vettius Agorius Praetextatus, the acting city prefect in 367 A.D., as the financial benefactor. The question remains open whether the site was still used for cult purposes at the time, and whether Praetextatus was motivated by other political or urban reasons to rebuild it. With this restoration in Late Antiquity the Porticus Deorum Consentium received its final appearance. In the subsequent centuries it increasingly fell into ruin. In 1834, it was excavated and rebuilt in 1858 (with further structural additions in the first half of the 20th century) in part as an anastylosis. 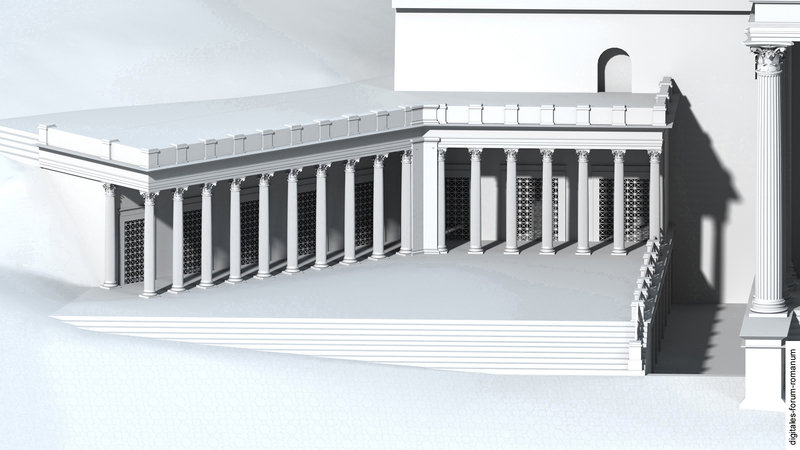 The reconstruction of the portico for the earlier phases is based on the literary sources and an analysis of the wall structures at the Capitoline Hill, which have made the existence of such a cult site highly plausible. 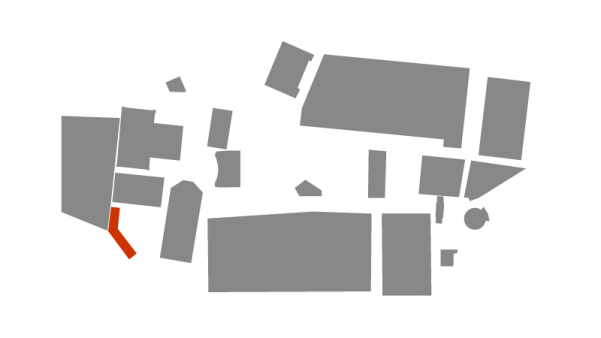 The remains of foundational walls in the sixth chamber have been interpreted as the remnants of a temple architecture, which stood there since the 3rd century B.C. However, it is difficult to develop a precise conception of this site. The construction of the Temple of the deified Vespasian also marks a period in which the portico was structurally altered: The area situated in front of the pre-existing chambers was flattened and paved, which resulted in the creation of several chambers that were located on a lower level and orientated northwards in the direction of the Temple of Vespasian. On the paving a row of columns, which bent off in an obtuse angle, was erected in front of the upper row of chambers. It has not yet been determined whether this portico was set up as a two-storey structure. However, it was certainly possible to access the roof / second storey of the portico from the Tabularium until the Trajanic-Hadrianic period. Afterwards the passage in the Tabularium was closed up. The restoration in Late Antiquity seems to have recreated the structure in its former appearance from the Imperial Period. In any case no traces of substantial divergences from the former structural conception can be observed within the findings. Based on the addition of Praetextatus’ dedication inscription, scholars have argued that this process (similar to what happened with the adjoining Temple of Saturn) was explicitly understood as a conservationist procedure and presented as such. This view should be challenged: What is generally accepted is the reconstruction of the fragmentary inscription stating that the portico was restored in its venerable form. However, when we reconstructed the portico within our digital model of the Forum, it became apparent that this addition cannot be taken for granted: The central part of the inscription’s wording, which explicitly refers back to the past (“in formam antiquam restituto”), are a modern addition and thus do not state any certain facts about the ancient structure. Wide-ranging consequences for the historical interpretation of the portico follow from this insight. Until now the portico was treated as a paradigmatic example of a certain conservationist attitude in Late Antiquity towards the past – this argument was premised on the relevant passages of the added dedicatory inscription. However, this assessment of the Porticus Deorum Consentium is problematic and no longer tenable in light of recent insights. F. A. Bauer, Stadt, Platz und Denkmal in der Spätantike. Untersuchungen zur Ausstattung des öffentlichen Raums in den spätantiken Städten Rom, Konstantinopel und Ephesos (Mainz 1996). L. C. Bossert, IN FORMAM ANTIQVAM RESTITVTO? Überlegungen zur Inschrift der Porticus Deorum Consentium (CIL VI 102) und ihren Ergänzungen im 19. Jahrhundert, in: BeStaR (forthcoming). P. Bruggisser, „Sacro-Saintes Statues“. Prétextat et la Restauration du Portique des Dei Consentes à Rome in: P. Behrwald – R. Witschel, C. (ed. ), Rom in der Spätantike. Historische Erinnerung im städtischen Raum, Stuttgart: Steiner, 2012, 331–356. G. Nieddu, Dei Consentes. in: E.M. Steinby (ed. ), Lexicon Topographicum Urbis Romae II (1995) 9–10. G. Nieddu, Portico degli Dei Consenti, in: A. M. Bietti Sestieri (ed. ), Roma. Archeologia nel centro. Bd. 1, L’area archeologica centrale, Lavori e studi di archeologia 6 (Rom 1985) 24–28. P. Pensabene, Tempio di Saturno. Architettura e Decorazione, Lavori e studi di archeologia 5 (Rome 1984).